A new study conducted by Arrun Saunders and Hugh Lewis, at the University of Southampton, indicates that global warming may be making the growing problem of space junk even worse. As the Earth warms, the upper atmosphere shrinks which reduces drag on objects in Low Earth Orbit (LEO). Reduced drag means they can maintain their orbit for longer, so the junk stays in place. Atmospheric drag was a big surprise for the engineers behind the Skylab and Salyut 7 space stations. Unusually high Solar activity heated up the Earth’s upper atmosphere, causing it to expand. Although the atmosphere at those altitudes is so thin as to be practically indistinguishable from a vacuum, it still created enough drag force on the space stations that their orbits began decaying till they eventually plummeted to Earth (Skylab landed in the Australia, and the Australian government famously gave the US Embassy a ticket for littering!). This drag effects everything in LEO so that space junk will eventually clear itself, and is the reason why satellites (including the International Space Station) need to either be given routine boosts back to their proper orbit, or deliberately de-orbited in a controlled re-entry to avoid dropping them on inhabited regions. In their study, Saunders and Lewis found that as the greenhouse effect increases, more heat is trapped in the lower atmosphere. This means that the outer atmosphere paradoxically gets colder and shrinks. A smaller, less dense outer atmosphere causes less drag on LEO satellites, which is good news for mission controllers, but bad news for space junk. 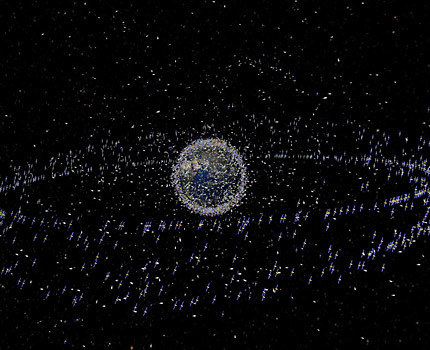 Space junk is an increasing problem, where the space round earth becomes more polluted with everything from decrepit satellites to lost tools to broken debris (resulting from legitimate satellites colliding with previous junk). While most of the junk is very small, it is all travelling at orbital velocities many tens of times faster than a rifle bullet and so poses a very real danger to satellites and space stations. When there is a collision the results are catastrophic. One such collision has already happened and made world headlines in February 2009, when a defunct Russian Cosmos satellite collided with a modern Iridium satellite at an equivalent speed of over 35000km/h.